Robert Vallieres struggled to find his "new normal” when he returned home after serving in the military. An accident in Kuwait left him suffering from traumatic brain injury (TBI) internal injuries, leaving him in constant pain. After clinics, bottles of painkillers, and behavior modification pills, hope seemed to vanish. Unfortunately, due to sales rights restrictions, we cannot offer Wounded Warriors for sale in your country. • Wounded Warriors is Vallieres's story of self-healing from crippling "invisible” wounds with the help of birds. Robert Vallieres struggled to find his "new normal” when he returned home after serving in the military. An accident in Kuwait left him suffering from traumatic brain injury (TBI) internal injuries, leaving him in constant pain. After clinics, bottles of painkillers, and behavior modification pills, hope seemed to vanish. Until a local weekly newspaper ad caught his eye: a bird-watching trip to see raptors in the mountains of New Hampshire. Emily Dickinson's poem that states,"Hope is the thing with feathers that perches in the soul, and sings the tune--without the words, and never stops at all,” sprang to his mind. 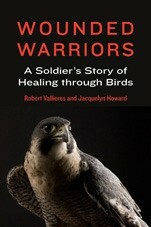 Wounded Warriors is Vallieres's story of self-healing from crippling"invisible” wounds with the help of birds. The problems of (TBI) and post-traumatic stress disorder (PTSD) do not have a definitive solution. His story of recovery offers a winged hope to thousands of military personnel who suffer this physical and mental internal battle.